Paperwhite Narcissus is easy to force into bloom indoors. The bulbs do NOT need to be placed in cold storage to bloom. Paperwhite bulbs begin to grow as soon as they are planted, with fragrant flowers appearing in 4-6 weeks. Each tall flower stem produces several small, snowy-white flowers. Make your flowers last longer by keeping the plant in a cool location. Blooms will look fresh for 3-4 weeks if kept at a maximum of 65°F/18°C. Looking to buy paperwhite bulbs? Choose paperwhite bulbs that are firm, not soft or mushy. There are a couple popular varieties I recommend: 'Ziva' is a prolific bloomer... and 'Ariel' is especially fragrant. Paperwhites are also sold as kits for the holidays. They're foolproof -- just add water. 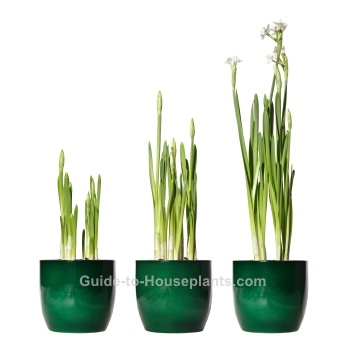 Plant paperwhite bulbs in a shallow pot filled with potting mix. Set as many bulbs as will fit in the pot, as close together as possible without touching. Top with potting mix, leaving the tips of the bulbs exposed. Water thoroughly to moisten the soil. Place in a cool (50-60°F/10-24°C) low-light location until shoots appear, usually in 2-3 weeks. Then move pot into warmer temperatures and a brighter location, but out of direct sun. Turn the pot once in a while so that all the stems get equal light. They're fast growers, with blossoms appearing in 4-6 weeks from time of planting. The clusters of small, white flowers last about 3-4 weeks. Cover the bottom of a shallow container with pebbles (or glass marbles) about 2-3 inches deep. Set the paperwhite bulbs on the pebbles with their tips pointed up. Cover the bulbs with more pebbles, leaving their tips exposed. Add just enough water to reach the bottoms of the bulbs. Set them in a cool location and give them the same care as described in #3 above. Height: 12-15 in (30-37.5 cm). Plants often need staking to stay upright. Light: Low to bright light. Temperature: Cool to average 50-65°F/10-18°C. Too-warm temperatures will shorten the life of flowers and may cause flower buds to shrivel and turn brown. Soil: Peat moss based potting mix (or use pebbles as described above). Fertilizer: Feed every 2 weeks with high-potassium liquid fertilizer diluted by half from planting until blooming. Do not fertilize while in bloom. 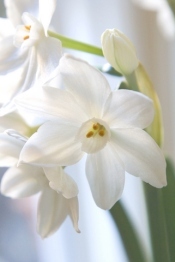 Propagation: Paperwhite narcissus bulbs cannot be forced into bloom again and can be discarded.